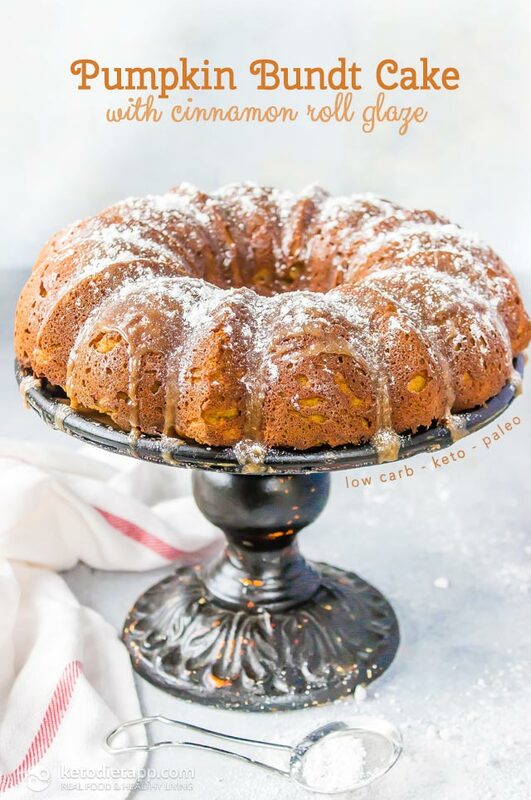 This Keto Pumpkin Bundt Cake will be a hit with any pumpkin lover! I can’t get over just how good the cinnamon roll glaze is, you’ll want to eat it with a spoon. 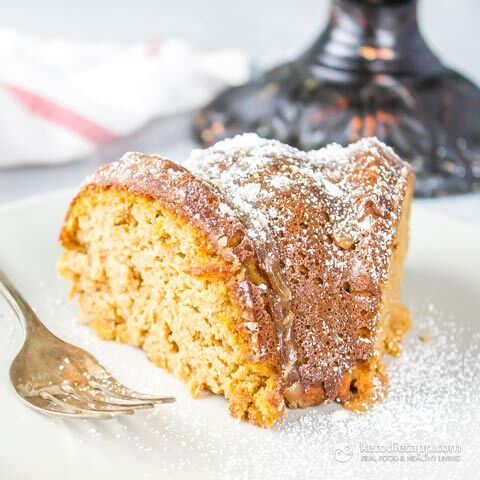 Sometimes low-carb cakes have a dry texture but the pumpkin puree and eggs keep this cake light and airy. For just one bowl and simple ingredients this cake may just become your go-to base cake recipe. 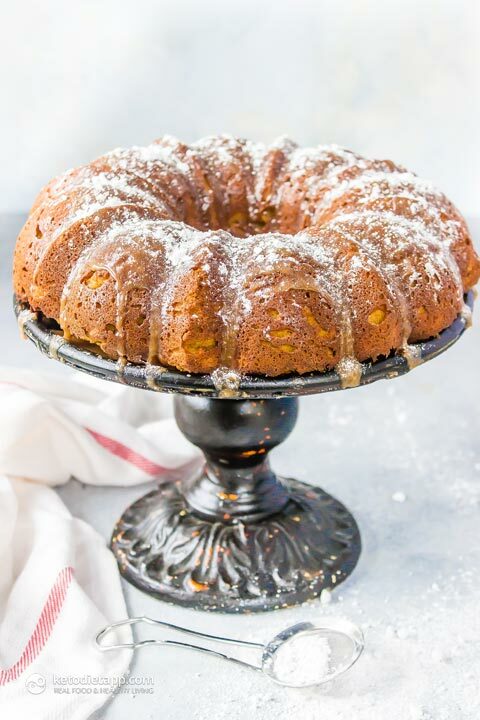 For those times when you need a cake that’s not pumpkin flavored you can swap the pumpkin out for banana, or even apple sauce. I love versatile recipes! Preheat oven to 160 °C/ 325 °F. 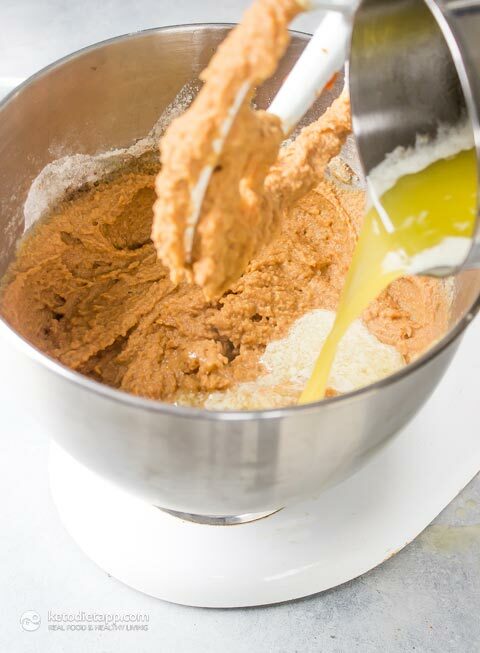 Combine the dry ingredients in a large mixing bowl and stir to combine. Add in the remaining wet ingredients: eggs, ... ... pumpkin puree, vanilla extract ... ... and melted butter. 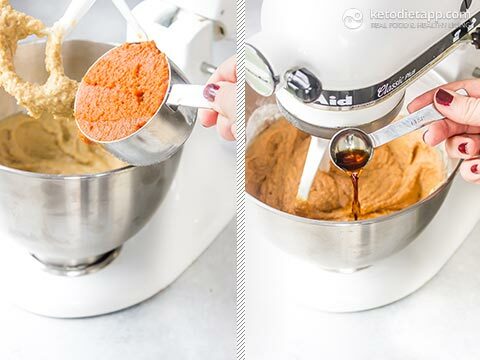 Use a hand mixer or stand mixer to combine until smooth. 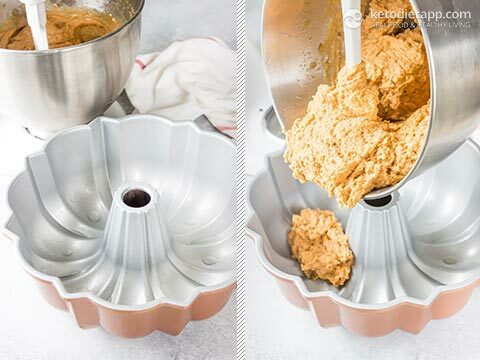 Pour the batter into a greased bundt pan. Transfer to oven and bake for 60 minutes or until a toothpick inserted into the middle comes out clean. Let cool for 15 minutes before transferring to a serving platter. Meanwhile, make the glaze by combining all ingredients in a small pot over low heat. Cook just until melted. Pour the glaze over the bundt cake. Dust with powdered Erythritol or Swerve. Slice and serve! To store, let it cool down and store at room temperature for up to 2 days, or keep refrigerated for up to 5 days. Fantastic! Thank you for sharing. I made this yesterday for my husband's birthday and it came out picture perfect and tasty. The only thing I changed was the amount of spice added. I doubled it as we love pumpkin spice. My daughter in law can't have dairy so I replaced the butter with refined coconut oil and it turned out amazing! Absolutely delicious recipe. Thank you Anne, I'm glad you enjoyed! Do you think this could be made as a cake instead? Just wanted to know, love that this is Keto friendly, would this also be considered Gluten Free? I'm Celiac and would love to incorporate this into my baking repertiore ...but need to know if it would be considered Gluten Free. From what I can see I want to think so, but just wanted to be sure. Thanks ! This was AMAZING! 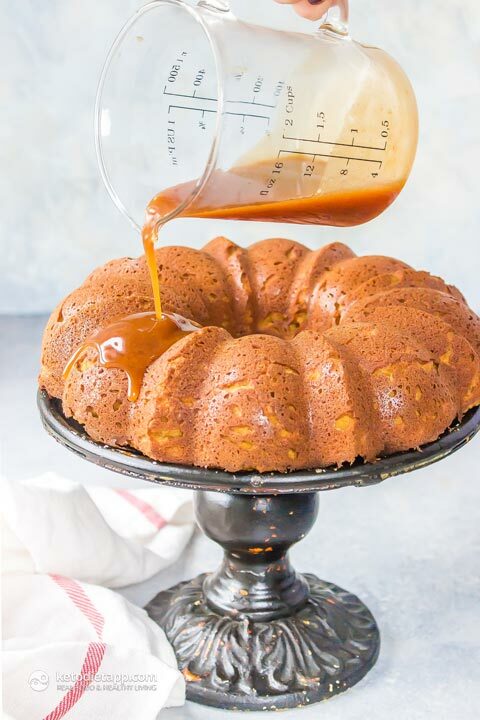 So quick to put together and so, so idiot proof  The only thing I changed was to use salted butter in the glaze and I'm so glad I did, I really think the slight saltiness offset the sweetness of the cake beautifully, it almost tastes like salted caramel! This is a gorgeous, moist cake, so light and so moreish. Thank you so much, this is a new favourite. Thank you so much for your lovely feedback, Anu ❤ I haven't thought of using salted butter but now that you said it I'll give it a go! Is the powdered version of the sweetener necessary? Can I use granulated instead? You can use granulated sweetener in the cake but not in the frosting. If you do, remember that one cup of powdered sweetener weighs less than granulated (for the same effect use 210 g/ 7.4 oz in the cake). OMG, this is the most delicious thing I have ever eaten! 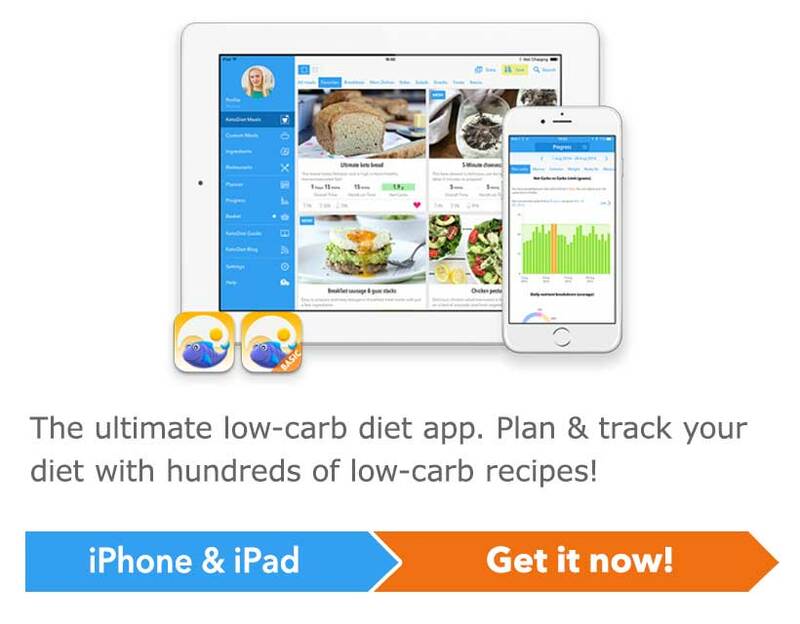 Keto, or not. Thank you! Thank you Lauren for sharing this receip!!! I just tried it out and it taste SO good!!! It taste fluffy when it's hot. I used ground cinnamon instead of vanilla extract and it turns out not bad! Cinnamon and pumpkin is always the best match lol. Hi I was wondering if you can make this with coconut or gf flour? I’m allergic to nuts but I’d love to try it. Hi April, you can do that but you will need to adjust the amount of liquid ingredients. 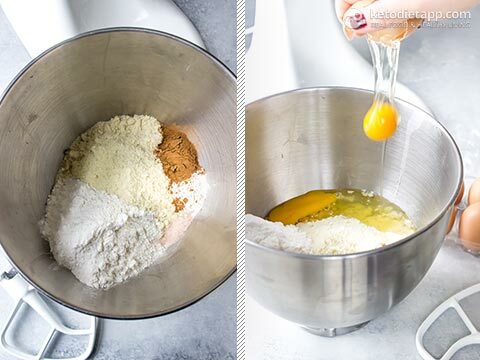 So for every cup of almond flour, you should use about 1/3 cup of coconut flour, plus increase the amount of eggs (you may need to use as many as 10-12 eggs). I hope this helps! Ok. I just have to take a moment to give you a HUGE shout out for this AMAZING recipe! I made this during the Thanksgiving holiday and have made it a few time since because we love it so much! I altered the recipe just a wee bit. I swapped out the Swerve with 1/2 cup coconut flour and 1 cup of coconut sugar, dumped in the whole can of pumpkin and added in about 1&1/2 cups of chopped walnuts and pecans. However, most hilariously, when adding the "pumpkin spice" I opted for the make your own and proceeded to add all the measurements for the pumpkin spice recipe (oops) realizing later that I was supposed to blend all the spices and then only add 2 tsp of the mixture. However, we loved it with all the spice so in all future versions I've added the whole amount. LOL. At least it was a happy accident. Then, for the topping, I whipped 1 cup heavy cream, 1 cup of mascarpone, and 1 tsp of vanilla. I kept this separate and whenever we sliced off a piece of cake I "buttered" the cake with the frosting. This dessert was an enormous hit with family and friends!!! Well done. 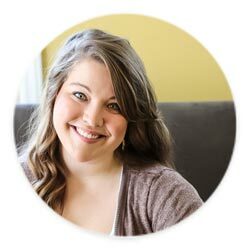 Thanks for sharing it on your blog! LOVE THIS. I made them into cupcakes to test the recipe since I don't have a bundt pan. modified the proportions a little since I have truvia (good conversion chart here for anyone looking https://www.wholesomeyum.com/natural-low-carb-sweeteners-guide-conversion-chart/ ). Ended up breaking my glaze by reheating it too many times ( would recommend starting the glaze right before the cake comes out of the oven so as to avoid this dilemma. Anyways, I cut each cupcake in half and added a cream cheese frosting and crumbled my broken glaze inside, ended up tasting like a pumpkin coffee cake and it is TO DIE FOR. Getting ready to make. Concerns...seems like a lots of erithertol. I use pyure and it is twice as sweet as swerve. So will add in half cup increments. Also... recommend for freezing? TKS for sharing. Ok well I've gone and done it. I've made numerous recipes with almond flour. Never happy with results. Don't like the texture of almond flour. So this was my last ditch effort. OMG so divine! So thankful for a recipe that was successful and versitile. I used pyure and only 1/2 cup..plenty Sweet...went slowly and carefully through the recipe, checking, rechecking ingredients and measurements. Got it into oven and made the glaze. I must of been anxious to get it on the cake as I left it cool and poured it on...only to realize I forgot to take it out of the pan..woops! So that was fun and lost a chunk along the way. We made a whip cream/cream cheese topping and it was to die for. Plenty Sweet. Next time... probably will not do the glaze.. But thanks so much for a great recipe posted on my birthday. Best present I received. Oh my this is soooo good and so easy!!! I love the addition of pumpkin, it makes such a big difference and the texture is wonderful. My kids literally attacked it! The only thing I'm not sure about is whether we'll have any left for tomorrow  Thank you Lauren! Mine is amazing and I didn't even weigh the ingredients. What is it that you didn't like? Do you live in high altitudes? That may affect the baking. 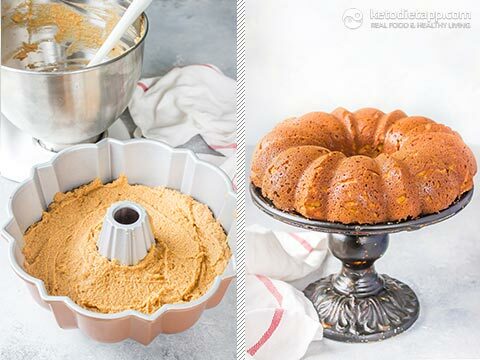 This was my first bundt cake and I threw it together in a rush...but despite both those things the cake was WONDERFUL. This is by far the best gluten free/keto baked good I’ve had so far and it was a crowd pleaser. We had a family over for dinner including their 12 yo daughter with celiac’s. Everyone loved it! If you use banana or apple sauce instead of pumpkin, it should still be keto right? Do you think this recipe would work as cupcakes? Absolutely! You will just need to adjust the cooking time and only bake them for 30-35 minutes. I was wondering if I can use stevia/truvia powdered sugar? I don't see the ingredients you use in the store where I shop. Love this. Mine is in the oven now! The house smells like fall! Thank you for the recipe. Quick question. Was thinking of doing a spiced cream cheese frosting instead of the glaze. Thoughts?